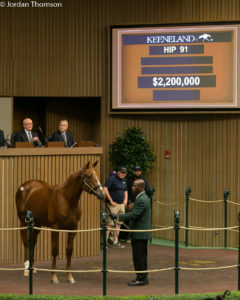 A total of 12 American Pharoah yearlings passed through the historic Keeneland sales ring and reported as officially sold on Monday during the first session of book one of the annual Keeneland September Yearling Sale, headlined by Hip No. 91, a colt out of the stakes winning stakes winning Indian Charlie mare Kindle, who was secured by Godolphin for the session’s top prince of $2.2 million. Initially sold as a weanling through the same ring last November for $400,000, the colt was consigned to this time by Woods Edge Farm’s Peter O’ Callaghan. “Well, we thought there was every chance he would break a million,” O’Callaghan said after the hammer dropped on the hefty price. “He’s developed the right way every way he could. He’s a stunning animal and a supreme athlete. O’ Callaghan explained that new owner Godolphin liked the grass success of his dam in the Monrovia Stakes (GIIT) at Santa Anita in which she raced twice, finishing second both times on the downhill turf course. Hip No. 6, a colt out of grade 1 winner Harmony Lodge (by Hennessy), who was bred by Glenvale Stud and sold to Nicoel Ruggeri, agent for Byerley Racing, for $350,000. The bay colt was consigned by Hunter Valley Farm, agent. Hip No. 47, a filly out the winning Smart Strike mare Intelyhente. She was bred by the partnership of William Duignan and Tranquility Investments and brought $310,000 from JS Co. out of the Paramount Sales, agent, consignment. Hip No. 53, a colt out of stakes winner I O Ireland (by Giant’s Causeway) bred by Team Block. He was consigned by Scott Mallory, agent, and sold to K. K. Eishindo for $325,000. Hip No. 63, a filly out of Ivanavinalot (by West Acre), who is also the dam of champion Songbird. This $325,000 filly was consigned by Eaton Sales, agent, and bred by Capital Bloodstock. 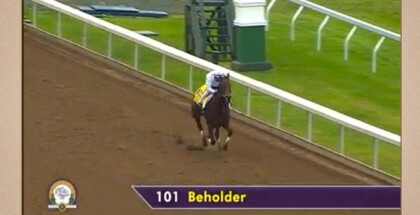 Phoenix Thoroughbreds was the successful bidder. Hip No. 69, a colt out of grade 1 winner Joyful Victory (by Tapit) also sold to Godolphin for $200,000 and was consigned by Taylor Made Sales, agent, for Aaron and Marie Jones LLC. Hip No. 87, a New York-bred colt out of graded winner Khancord Kid (by Lemon Drop Kid), who is also the dam of millionaire and Breeders Cup Filly and Mare Turf Sprint (GIT) winner Bar of Gold, sold for $500,000 to Gatewood Bell, Agent for Cromwell Bloodstock. 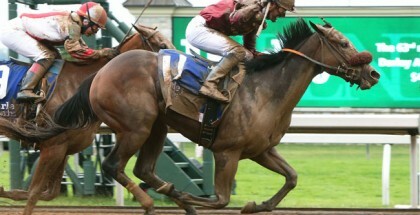 The colt was bred by Chester and Mary Broman and consigned by Sequel New York, agent. Thomas has long experience with the colt’s female family, having trained Khancord Kid herself. Thomas says the buyers liked this colt because he was a New York-bred who was born and weaned at Thomas’ Chestertown Farm. Hip No. 167, a filly out of Mariel N Kathy (by Corinthian) and from the female family of recent stakes runner Zulu, sold for $300,000 to Green Lantern Stables, LLC and was consigned by Betz Thoroughbreds, agent. Hip No. 174 , a homebred filly for Clarkland Farms out of Maybellene (by Lookin at Lucky), who sold for $375,000 to LEB, agent for West Point Thoroughbreds. Hip No. 179, a colt out of Meerkat Miss (by Giant’sCauseway), sold for $475,000 to Beth Bowman Harper. The colt was bred by Gabriel Duignan, Windmill Manor, Liam Duignan & Tranquility Investments and consigned by Eaton Sales, agent..
Hip No 210, a filly out of the unraced Galileo mare Mohini (IRE) bred by Lynch Bages Ltd and sold to Tony Lacey, agent, for $675,000. Hip No. 228, a filly out of grade 3 winner My Happy Face, sold to Clay Shearer, agent, for $300,000 from the by Clearsky Farms consignment. 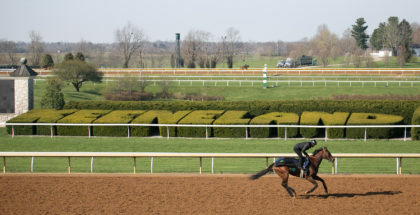 Fifteen additional American Pharoah yearlings are scheduled to sell Tuesday in during session two of the first book beginning at 1 p.m. Keenland will live stream all the auction action at www.keeneland.com.